Chajem Ruttner was my second cousin twice removed; his grandfather and my great-great grandfather were siblings. I have birth records for some of Chajem's siblings, and I knew that some of them died in the Holocaust. I kind of suspected that Chajem had as well. Except he hadn't. It looks like Chajem ended up in Budapest. He was 20 years old when he died in 1942, and it says that both of his parents were already deceased. His death does not seem to be Holocaust-related, as he died of pulmonary disease. Chajem was born in Tecso (today's Tiyachev, Ukraine), quite a distance from Budapest. I've also seen records from people born in Galicia, Poland, and all over Austria-Hungary covered here. It's worth a search for your family! 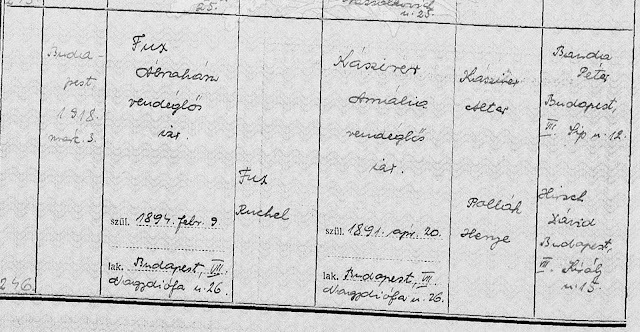 Note that for some reason, some records written in Hungarian (so Latin letters like those in Chajem's death record, which can be easily read by English speakers) have been indexed by FamilySearch into Russian. Searches in English do find these, and even if you don't read Russian, it's worth looking at those records, since they may be your family. Even if those family members never lived in Russian-speaking areas. Also, not all of the records for this collection have been indexed (yet). You can browse through a particular town's records if you know your family lived there. So how do you get to these records? First check if the record you're looking for is already indexed. With a (free) FamilySearch account, search from https://www.familysearch.org/search/collection/1452460. If you don't find indexed records and you know where your family lived. You can page through record books. Click here and pick the county and then location in which your family lived. This works well in smallish towns. Note that some of these books are already indexed on MACSE (subscription required) as well. With that, I was able to find the marriage of my great-grandfather's brother, Abraham Fux/Rutner. Although I knew he lived in Budapest for a time before coming to America, I didn't know the district in which he married (District VII). MACSE's indexing of these records--although FamilySearch has not yet indexed them--allowed me to find his marriage. You can see it here. NOTE ON MACSE. Krisztián Skoumal notes that MACSE’s indexing focused to Budapest's marrigages in the beginning and when it was ready the focus is the county capitals. I have never found FamilySearch to be user-friendly but I suppose I will have to bite the bullet and get into it sooner than later. Thank you for the push. That's awesome! I recently discovered that I have distant relatives living in Budapest, and connected with them on Facebook! My grandfather's grandfather immigrated from Galicia to Germany around 1890; apparently he had a second or third cousin who immigrated around the same time to Budapest. I was able to trace three generations of the family up to the early 1940s, and now I connected with the descendants who are still living there today. So much easier to scroll through rather than search by microfilm which is what I did several years ago to find my husband's ancestors in Bonyhad and Hogyesz! Gotta love FamilySearch!